Caregiving for a loved one with dementia is not something anyone usually plans to do. Because of this, not many caregivers have had time to prepare for the caregiving journey. Dementia education is something that is essential for any caregiver, as well as their family and friends. I have found over the years that so many caregivers need help understanding the disease itself. There are many different types of dementia including Alzheimer’s Disease, Frontal Temporal, Lewy Body, and Multi-infarct dementia, to name a few. Research is showing that many individuals have more than one dementia, labeled as “mixed dementia”. It is important to know the type in order to know how the disease changes the brain. Knowing the type of disease gives you knowledge of the progression, types of medications used, and issues that can arise, such as paranoia, hallucinations and delusions. Having good communication skills is crucial. Knowing the “tricks of the trade” for communication will make each day easier. Family and friends will visit more often if they understand the best way to communicate with someone living with dementia. As the disease progresses and more communication is lost, knowing how to use gestures and signage is very helpful. Learn about ways to keep your family member safe in the home and in the community; things that are helpful include alarms on doors, a Medic Alert Safe Return bracelet, neighbors who are aware of your situation, and having an emergency plan if you can’t be the caregiver. Quality of Life is a term often used to describe a life that is worth living. How do you give your loved one the best possible life living with dementia? They need to have purpose, they need to feel love, they need a sense of community, they need to laugh, have fun and do the things they did in the past that they are still able to do. Currently, we are starting to see how well Montessori programming works with persons living with dementia. 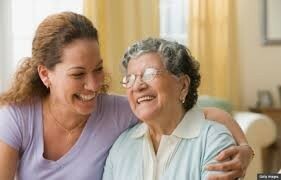 Of course, quality of life is something caregivers need as well. Over the years, studies have shown that over 50% of caregivers have heart problems due to the stress of caregiving. Learn how to manage your stress, take time for yourself and overcome the reluctance of asking for help. Friends and family are not always sure how to help. Make a list of what you need help with and when. Get yourself to a support group so you can be with others who are experiencing similar caregiving stresses. In conclusion, know where resources are in your community, including the Alzheimer’s Association, (800) 272-3900 and the Area Agency on Aging of Western Michigan, (888) 456-5664. These agencies provide services and support to those with dementia and their caregivers. Additional resources can be found online as well. Chris Simons is the Director of Dementia and Life Enrichment Services at Clark Retirement Community in Grand Rapids, Michigan. She is a Certified Therapeutic Recreation Specialist and a Certified Montessori Practitioner. The next Family Caregiver University class, Dementia - What One Needs to Know to Care for the One They Love, will be held on Thursday, February 28 from 1-3 p.m. at the Area Agency on Aging of Western Michigan (AAAWM). AAAWM is located at 3215 Eaglecrest Dr. NE, Grand Rapids, MI 49525.